I love to start my day reading a little poetry while sipping a steaming hot coffee in my favourite chair with a view of the lake. From my poetry shelf, I pull down, at random, a book of poetry and like stabbing a finger to a map to choose a chance destination, I flip the book open to an arbitrary page. So, without judgment or censorship, I’m going to share whatever I find on that random page with you. 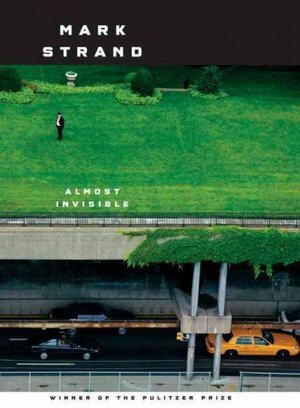 Today’s off the shelf selection is Mark Strand’s, “Almost Invisible“. probably caused by the cloud of dust their march had created. I’d love to hear what you think about the poem and/or the poet, your reactions, what feelings or memories the piece evokes. Care to share? I liked “The Students . . . .” The point is nicely taken. We go about our days, blundering through the haze we call work not knowing, not looking beyond anything. Yet the stars are always there. These few words summon within us an urge to look once again, to keep looking, keep searching, keep finding. The stars are there and will always be. Will we see them? away from all that I had known.” A rented house by the sea sounds like a retreat away from the place that was difficult for him to continue living. That firelit stream of sound finally came to his ears with a message, and in my opinion it was, “This too shall pass.” There is hope. After waiting on the porch, each night and simply wishing, I wonder what finally moved him to climb the hill behind the house, Mary? What was he then searching for instead of just sitting and waiting for it to come to him? Enjoyed this, Cheryl, our human journey might at times raise sound and fury but is, in the end, a speck in the eternal universe. Where the poet sits — and you at Otter Lake — is a visual depiction of the same expansiveness talked about in the poem. So the message could be not to thrash around like a fish on a hook, but stay calm and go with the flow … flow being change, Dace? Oh, gosh no, Cheryl, we want to raise some dust storms along the way! I wonder what ‘surge of feeling’ (s)he had, and if the healing journey was completed. It’s a strange poem. Gilly, I was intrigued by his/her desire to be led ‘… away from all that I had known’ and felt this desire to make such a major change in their world was resolved in the last two lines.
. . . by making no change at all? Gilly, I think by not abandoning all that he has known.